It’s from a brand called “MITTISE“..
And in their own words…. “Mitti Se means ‘From the Earth’. We offer Pure, Natural and highly effective Body Care, Cleaning & Health products which are safe and Earth-friendly. Minimal processing goes into our products so the natural complexity of the ingredients is maintained. Our products include ingredients and Ayurvedic formulations that are tried and tested over the years. We have also enhanced their effectiveness by adding on to them where necessary. Our goal is to make our homes, our lifestyles and Earth safer. We provide affordable alternatives to reduce dependence on harmful & unsustainable chemicals. Products which use harmful chemicals harm the environment during manufacture through release of toxic by-products. They cause health issues during their use and continue to harm the environment after disposal. All of this can be avoided by harnessing the power of nature and using natural ingredients. 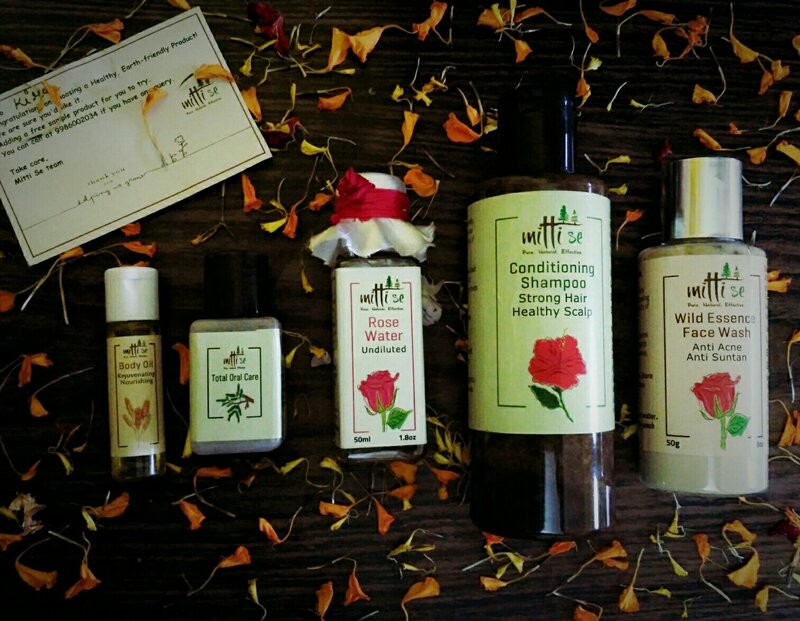 * Wild Essence Face Wash – Anti acne and Anti suntan.. which claims to clear pores, removes fine wrinkles, imparts a uniform complexion and healthy glow..
* Conditioning Shampoo – Strong hair and healthy scalp.. it claims to remove oil and dandruff. Makes hair healthy, strong. Revitalizes dull, damaged hair. Regular use improves hair quality. * Undiluted Rose Water – Claims to freshen, cleanse, tone skin, maintain pH balance, soothe skin and eyes and to be suitable for edible purposes. * Total Oral Care – Claims to clean teeth, relieve bad breath, Sensitive teeth, bleeding gums, prevent plague. Fight bacteria, remove stains, tighten gums. * Body Oil – Rejuvenating Nourishing… Claims to nourish, moisturise and firm skin. Remove fine wrinkles, stretch marks, scar marks. Increase blood circulation.